As far as airport experiences go, the Delta Airlines terminal at New York City's LaGuardia is a fairly memorable one. There are iPads as far as the eye can see: at restaurant tables, on food counters and within reach of every waiting area. It's clear that travelers appreciate being able to browse news sites, write Facebook updates and play games. But OTG Management, Delta's food and beverage partner at LaGuardia, debuted the iPads in June 2012 for one main reason: to drum up business. The tablets are designed to encourage travelers to buy food from the instant they pass security to the moment they board. In fact, if you happen to be online 30 minutes before your flight, an alert will pop up suggesting a snack to order. The result? Customers ordering via the iPad spent 15 to 20 percent more than other patrons, with sales per passenger double the industry average. "In general, businesses need to be thinking about digital strategies beyond content, and what platform or device will help create that experience for their customers," says Charlie Miller, associate partner of New York-based design and development agency Control Group, which was tapped to execute the iPad project. "OTG's choice to invest in an iPad experience clearly paid off. It has enabled them to transition from a food and beverage company into a technology company." The rise of mobile commerce and superpower payment system Square have made the iPad the hottest point-of-sale system around, and integrating the device into business models has shot up the priority list for many companies. Of course, easier said than done. iPads are designed to be personalized, without careful management and shared-setting controls. According to Miller, it can take just minutes for consumers to undo and degrade the curated experience in a shared commercial environment. Control Group's solution was to create both a consistent experience for customers and a robust content-management system for OTG. The agency developed a custom browser that looks and acts like Safari and allows people to securely access content that is often blocked in commercial settings--Facebook, for instance--while a management platform allows OTG to easily update menus, add apps and quickly reset the system if there are glitches. "As soon as there's a crash, people abandon tech, so it must be as resilient as possible," he explains. 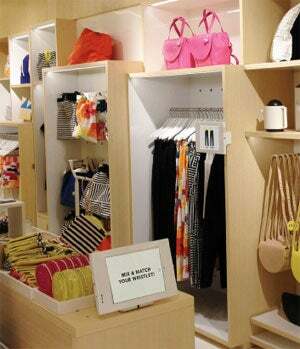 Style guide: Kate Spade's Saturday brand employs iPads as digital signage. Control Group put those principles into practice again with Kate Spade's Saturday brand (so named because stores receive new merchandise every Saturday). For the March launch in Tokyo, the retailer introduced a "reimagined" hybrid mobile-retail experience featuring iPads in various store zones that function as digital signage. Customers and sales staff can use them to access product information, get up-to-the-minute marketing messages and check out user-generated images and style guides suggesting ways to wear an item. A major benefit of such systems: data. "One of the great things about using iPads as commercial touchpoints in retail is that we can make analytics a core piece of the experience," Miller says. "There will be a tremendous amount of business intelligence derived from what items people are looking at that will help make merchandising decisions. iPads might not work for everyone, but all smart businesses should be thinking about it." 1. Define your business goals. Avoid building "trophyware," Control Group's Charlie Miller says. "I've seen graveyards of dusty iPads, because if there is no goal other than the cool factor, it will last about two days before the novelty wears off." 2. Control the customer experience. Make it easy to access and use the iPads. "Don't lock them down in bulky cases or cover the home button," Miller warns. However, since people like to tinker with devices, restrict access to default apps and settings to ensure that the experience remains as consistent as possible in a shared environment. 3. Make it easy to manage. Control Group built a flexible platform for system maintenance, updates and restoration, bearing in mind that content must remain dynamic and fresh to keep customers interested. 4. Leverage analytics. Track and analyze data on customer behavior to make more informed business decisions.